Yet another day in the world of T-Mobile, and yet another day with news of a possible T-Mobile merger in the U.S. Like many before him, Deustche Telekom’s CEO Tim Hoettges has realized the potential behind a merger with another carrier, but recognizes the struggles and legal barriers in place. On a conference discussing DT’s Q1 earnings, Hoettges remarked that he is open to creating a “super maverick” carrier in the U.S. In other words: Having an “Un-carrier” network operator with a subscriber base on par with AT&T/Verizon. Like many of us, he’s been “getting signals” from the regulatory bodies that such a deal isn’t likely to go through easily. And remarked that with the situation as it is now, the best way forward is to continue developing the business so that it creates the most value for shareholders. 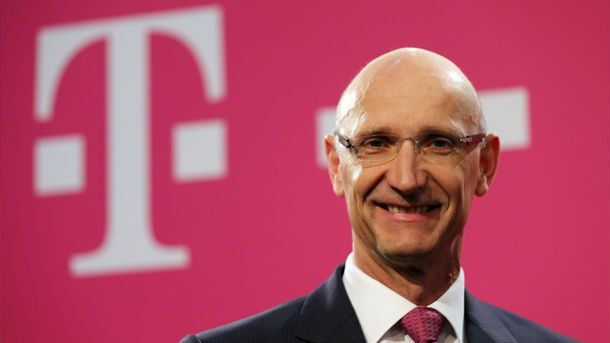 But here’s a big talking point for you guys: Deutsche Telekom’s CEO has said he sees value in having a “Super Maverick” carrier. Dan Hesse from Sprint has stated that a “stronger number 3” would be better for consumers and competition. Rumors have indicated that Masayoshi Son has been approaching banks to get financing in place to push through a bid this summer, despite skepticism from the FCC and DoJ. T-Mobile’s executives are mostly quiet on speculation. Nothing’s being denied. They all think’s it’s a good idea. Does that mean we’re facing the inevitable? Is regulatory opposition the only thing standing in the way of an eventual merger? This is something I don’t mind as long as everything goes GSM and T-Mobile has complete control. Have you ever seen a merger where the smaller company takes control? It’s over. T-Mobile and Un-carrier are dead. T-Mobile is the same size as Sprint. Just 4 Million Customers difference. And less spectrum. Uh… Whoever is teaching you English should be fired. You don’t seem to have even a remote understanding of how to use periods. I hope you don’t pay out-of-pocket for your lessons. It’s a hard language to learn, but holy crap. Far from dead, Mr. Hog…far from dead. Yes when CenturyLink bought what was then Qwest. Technically MetroPCS bought TMobile in a reverse merger, then kept both brands alive and let the stronger network survive, TMobile. Actually, Son said if they bought TMo, they see Legere being the front runner for the CEO spot. So if the merger does happen, TMo will take over. I understand your pessimism, but I’m going to be on the naive side this time and disagree with you. Sure, my optimism and soul will be crushed when the ride is finally over, but it’s so much easier to enjoy a train ride when you don’t know the bridge is out. Apple, when they bought NeXT, whose CEO, one Steve Jobs, promptly ousted Apple boss Gil Amelio and took over the company, putting many ex-NeXT employees in high-ranking positions, and scrapping the old Mac OS in favor of a new, re-skinned version of NeXTSTeP. That one worked out pretty well, as it turned out. That said, I wouldn’t really want to risk it with T-Mobile and Sprint. If the merger goes through and TMO is forced to switch to CDMA, I will switch. I love TMO’s uncarrier plans, but I like GSM technology more. I guess the only carrier that will meet my needs is AT&T. Damn! More then likely it would stay a GSM carrier, and migrate Sprint customers over to TMobile while they refarm pcs for HSPA+ and LTE. There is no way the combined company would backtrack to CDMA. LTE is set to become the next global standard and even Sprint has “seen the light”. They’re slowly installing LTE and even planning on allowing phones to be unlocked next year. If anything I hope it would be like how T-mobile handled MetroPCS. Move new and upgrade customers to LTE enabled phones until the majority is off CDMA and then finally cannibalize the spectrum and deploy more LTE. i believe sprint’s strength came from providing great coverage in rural areas where t-mobile couldn’t and at a price cheaper than verizon who has coverage everywhere. Does anyone else notice the bias when executives talk only about what’s good for the company and merely throw in a bone to customers? Make no mistake, the monopolistic is a market, the better it is for corporations and the worst for consumers. Of course executives all over the world agree that it’s a swell idea that a merger would make of two companies a member of an exclusive trifurcated market. DT realizes there is a huge potential in Tmo USA, so they are more likely to keep it or sell it at VERY HIGH PRICE — Son/Sprint couldn’t afford it at all. I prefer DT keeping it cuz we need German efficiency, thanks to its rapid LTE rollout. Wow, you’re giving “German efficiency” credit for the rapid LTE rollout? DT wasted years not investing in infrastructure because they didn’t believe in this market. Hell, they even used the money they got from AT&T to pay off their own debt. They been trying to get rid of TMo for years because they thought it’s a dog. Then you finally have a good CEO who comes in and takes care of business, and DT is great. DT always treated its American subsidiary like a red headed step child. No offense to any red headed stepchildren out there. Too bad T-Mobile can’t get the investor funding necessary to grow and expand on their own. At the rate that they are paying out ETF’s eventually they’ll run out of cash. yea i’d like to see DT sell t-mobile to itself LOL. The FCC would buy that. Never going to happen. Sprint is broke – out of cash, out of ideas and out of time. They haven’t seen an annual profit in years, their, “NEW” Tri-band network is slower then the LTE-A networks AT&T and Verizon are building. Their network is oversold to MVNO’s making their ridiculously slow 3G data unusable. Without a compelling reason for customers to choose them the only option they have left is become the value seller and compete on price with the very MVNO’s they depend on for their cash flow. What will happen is that Hesse will retire, Masayoshi Son will realize he’s bought a dog with crippled, dated network technology and let it go in a fire sale to stop the cash hemorrhaging. Who’d buy Sprint? Dish, Google, Amazon, Apple…. It’s in DT’s interest to neither confirm nor deny talks of a sale/merger/whatever the kids are calling it these days because that keeps their options open and encourages other players to make counter offers. Sprint has huge spectrum and Son has already started replacing network and engineering staff. Its only a matter of time before management is replaced too and he has more money to spend from alibaba where his investment is worth $60b. I wouldn’t take his statement on seeing the value of a larger company to mean it’s going forward with Sprint. No one is going to deny that a T-Mobile the size of Verizon or At&t wouldn’t bring benefits to shareholders or customers. I see this as the guy simply stated this view point. If another entity were to offer the money for the company and the process would be smoother, yes he’d probably welcome the deal. Thanks, but no thanks Sprint. T-Mobile doesn’t need another major carrier, but Sprint needs T-Mobile because they want to get rid of their MAJOR threat. T-mobile was already stagnant when the AT&T fiasco happened, so it wasn’t as huge of a deal to put everything on hold for the acquisition. To enter a new deal now would be a HUGE hit to the momentum T-Mobile has rolling. Breakup fees or no, I don’t think it would be smart. There was a different CEO, but Timmy was still a top brass executive (CFO) during the AT&T acquisition fiasco. Softbank’s disastrous investment in Sprint can only be made whole if some one buys them out, but no takers there. The best option for them is to kill the competition from T-mobile. But the political hacks in the FCC have for years shamelessly rubber stamped every merger and made giants out of AT&T and Verizon and made the US the most concentrated market in the developed world. For the first time in a decade, T-mobile has shaken the S market and FCC and FTC have taken note of it. They are not now going to kill of the only disrupting force in the market place. Sprint and T-mobile merger is dead on arrival. Son is playing the market and waiting for a white knight. AT&T and Verizon would love it if Sprint bought T-mobile then things will be back to before. But FCC is never going to let the flame flicker out now. I think if the republicans and ATT/VZW block the spectrum auction restrictions the odds of the merger happening will greatly improve. This is why you don’t see T-Mo rallying as hard as they did over something like Overages (see petition with 150K+ sigs). They could easily be pulling in consumers to help impact the votes next week, but it benefits them either way. If they get the leg up on spectrum it helps, if it gets blocked it’s undeniable proof that smaller carriers cannot truly compete, and a merger is the only option. I don’t think the big 2 can get their way on everything, and fighting this hard over a little spectrum could really blow up in their face.